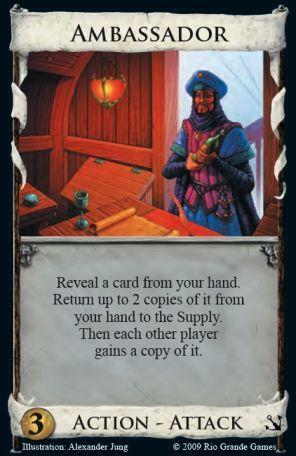 Reveal a card from your hand. Return up to 2 copies of it from your hand to the Supply. Then each other player gains a copy of it. Dominion Deck Builder allows you to create, share, discuss and rate Dominion games. Dominion is by Donald X. Vaccarino and published by Rio Grande Games. This site is not affiliated with either.